Telangana had been burning over 40 degree Celsius for some days. According to MeT department the situation will prevail for at least one more week. 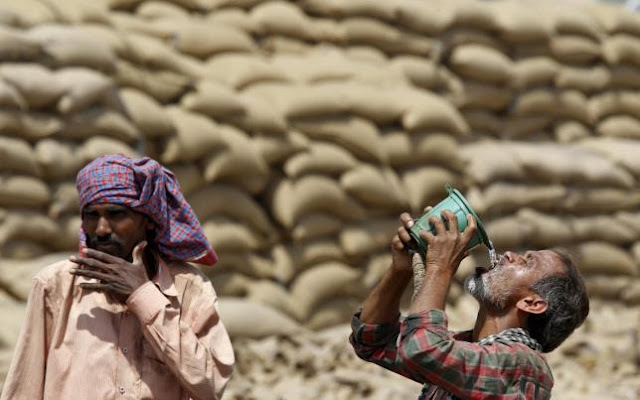 At least 161 people in Telangana have died due to heat stroke during this summer. Meanwhile the weather department has issued fresh warning predicting heatwave conditions at isolated places in all the districts of Telangana for next 5 days. Bhadrachalam, Ramagundam and Nalgonda were the hottest places in the state with each recording maximum temperature of 46 degrees Celsius, while the maximum number of deaths were reported from Khammam and Karimanagr districts of the state. On Friday the highest temperature recorded at Nalgonda was 46 degrees, while Ramagudem recorded 45.8, Khammam 45.2, Bhadrachalam 45.4, Nizamabad 44.4, Nizamabad 44.9, Adilabad 44.8, Hanamkonda 44.5. Hyderabad too recorded a temperature of 42.5 degrees Celsius. Government of Telangana has formed a three-member committee in all mandals consisting the local Sub Inspector, a civil surgeon and tahsilda to determine and verify the sunstroke death. Government of Telangana is providing Rs 50,000 as compensation to the victims' families under its Apathbandu scheme. Neighbouring Andhra Pradesh is also witnessing abnormal hike in temperature. Yesterday Bapatla of Guntur recorded a maximum temperature of 46.2 degrees, while Nandigama, Ongole, Janagamaheshwarapuram recorded temperature over 45. IMD has issued a 5 day heatwave warning for districts of coastal Andhra Pradesh and Rayaleseema region of the state. Meanwhile Andhra Pradesh govternment has asked people to remain indoors till evenings after getting the heatwave alerts.